Hot hot summer needs the rest in the cooling down place. 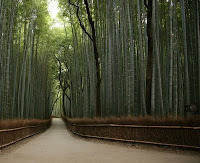 Kyoto, Nara and Kobe is just an hour distance by train. You can enjoy the rest of summer over there from Osaka. Here is the information around Osaka. The approach to get there, hundreds of stone statues are standing in line of both sides. You will hear the sound of silence,when you walk there in the early morning. 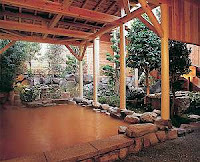 You have a fun in Osaka then take some Zen meditation session at there to relax. Kyoto has a lot of place to see but I recommend the bamboo forest in Arashiyama which is quite nice to cool down. If you take Hankyu line from Osaka, it is easy to get there. Surrounded by the nature, North side of Kobe has historical hot spring town called "Arima Onsen". You can walk in the woods or hike up to Mt, Rokko where can see the gorgeous view of Osaka and Kobe. Take a bus from Osaka or a cable car from the Kobe city. Autumn season is also nice to see the color of leaves over there.